In another industry first, Axolotl are excited to launch the award winning Axolotl Terracotta. Replicating the natural aesthetic of terracotta perfectly, Axolotl Terracotta is simpler and more cost effective than traditional processes. It retains the integrity of natural terracotta with variance in texture and colour, whilst enabling it to be utilised in designs never before considered possible. The terracotta aesthetic can now be realised anywhere you may normally use aluminium, CFC sheeting or stainless steel, yet in virtually any size or shape. As a coating, it's easily integrated into architectural projects, as it can be bonded onto traditional building materials, standard shapes and forms. Axolotl Terracotta is Australian produced and manufactured. It is offered in a range of colours and has unlimited design potential through being able to be individualised with Axolotl’s in-house ability to carve or etch almost any design in the surface. Terracotta has long been a part of our built environment as a beautiful and timeless building product, used throughout the world by leading architects such as Renzo Piano. Now Axolotl Terracotta reinvents this classic beauty to be more cost and production effective, without losing any of its aesthetic qualities. 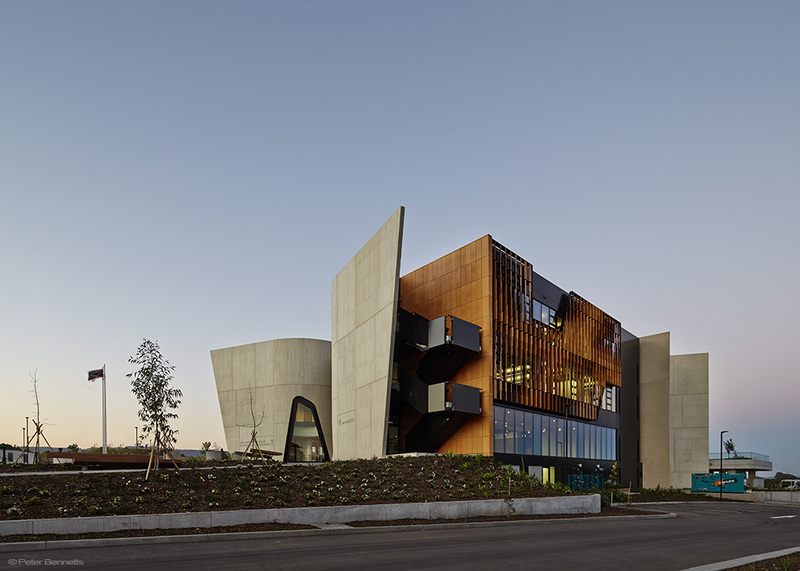 A strong connection to the environment and a focus on spaces conducive to reflection are some of the Buddhist ideals behind the architecture of the new Nan Tien Institute, located in the Wollongong region of NSW. Designed by Woods Bagot, the architecture of the building draws upon the Buddhist symbol of the lotus flower. 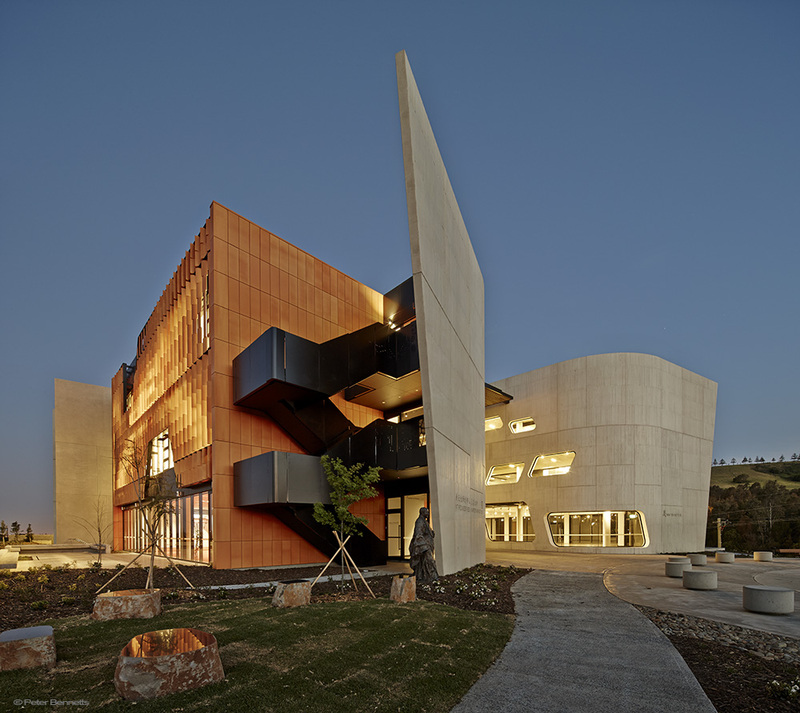 “The building combines the functions of a contemporary learning environment with a destination for visitors to Nan Tien Temple, bringing the community together to reflect and celebrate Buddhist philosophy,” says Georgia Singleton, Woods Bagot Director and Global Sector Leader in Education, Science and Health. Axolotl worked closely with specialist building company Hi-Tec to develop the stunning terracotta facade. Aluminium was chosen as the substrate as it enabled each blade to be articulated around an axis and locked in place - something impossible to achieve with standard terracotta. The blades subtly shift in direction adding a strong textural component to the building and when viewed from afar, conveys a contemporary lotus leaf. The structure of the building was formed by grouping spaces into four distinct ‘pods’, creating a public space in between. The ‘pods’ are linked by active bridges, allowing for the movement throughout the building to be a journey comprised of moments, destinations and thresholds. The building also includes a library, common area with café, art gallery and academic facilities. Published on October 30, 2014 by Jackson Wicks.